Manga Sister by LIVEARTSHOW at The Yard, Hackney Wick, London. 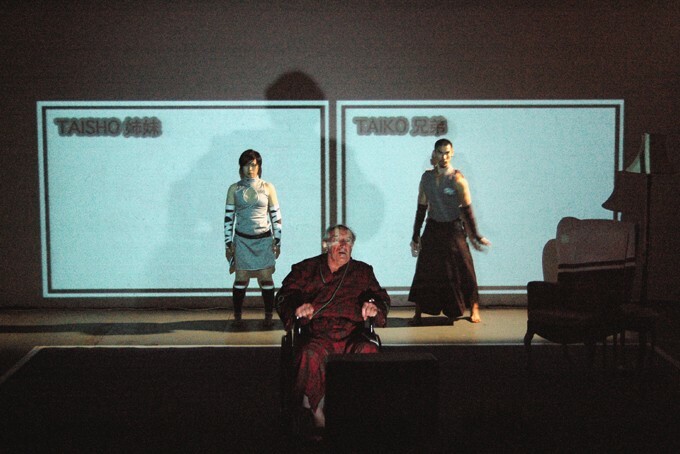 Try as I might, I can’t shake the old ‘short but sweet’ cliché when thinking about this production, although of course the premise – an elderly man in a retirement home being abused by his carers and his wife, finding refuge only in watching the anime cartoon “Manga Sister” every night at midnight – is far from sweet. But this 30 minute opera, performed on a small, temporary stage by four singers and two dancers (I’m categorising all that under ‘short’) managed to be bursting with inventive ideas that buoyed the tragi-comic story whilst maintaining a simplicity in its aesthetic, making it a real one-off (that’s the ‘sweet’ part, yeah?). Plot-wise, the production saw no point in restraining its imagination: not only does Manga Sister step out of the television to save the old man (by killing everybody, naturally), but he then follows her back, rescuing her from the evil brother who murders her night after night. The music was deliciously batty to match. What’s more, the gradual transformation of the old man’s voice from an inarticulate gurgle to the empowered cry “Manga Sister” was a clever and moving touch. However, the photo above illustrates my favourite idea of the night: An anime storyboard projected against the back wall, with the two dancers playing the manga characters performing in front of the projection – running on the spot in glorious 3D whilst Will Holt’s black & white drawings rushed in the opposite direction, or standing in a box next to their character stats. I was less comfortable when the dancers strayed further downstage, perhaps not so much because they were encroaching on ‘real world’ territory, but because the visual effect of the living storyboard was lost. Overall, though, it was definitely short but sweet.